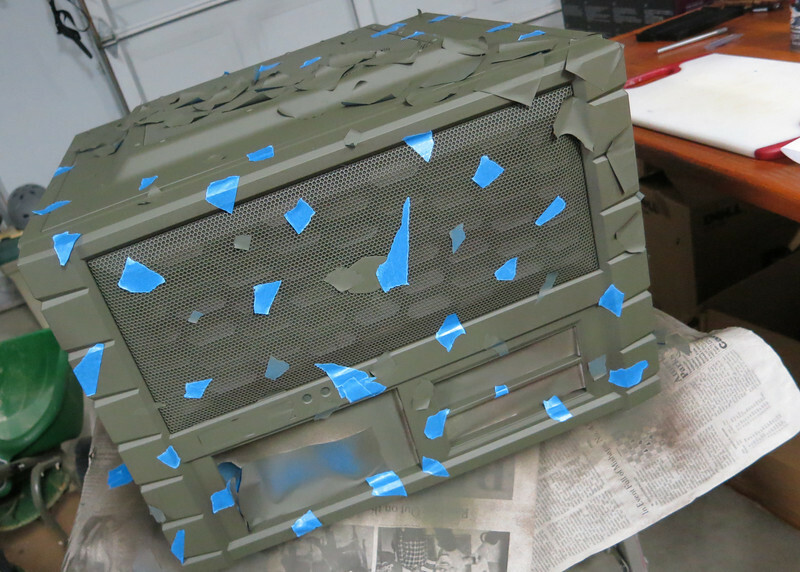 After the paint process was completed, I removed the top, side, and front panels from the case, as well as all of the masking tape behind the screens. A quick check around the fully exposed case showed no paint leakage requiring clean up, so I was ready to start plugging everything in. 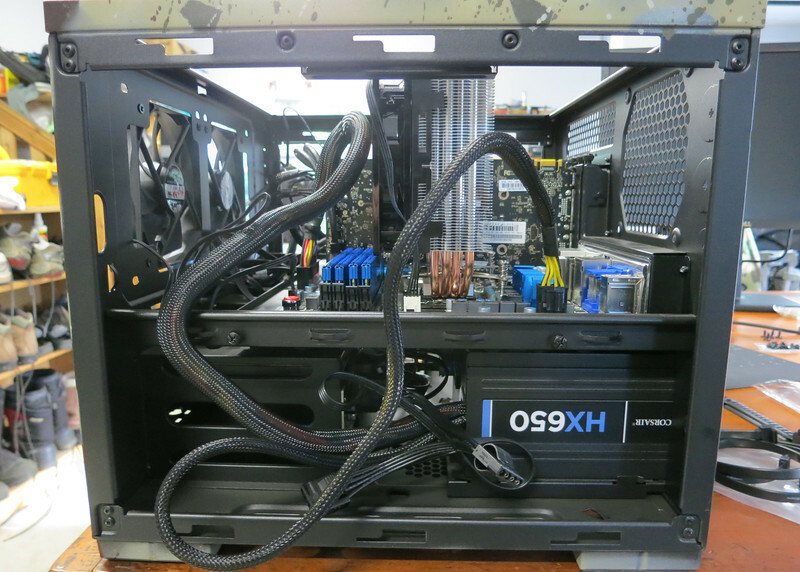 The CoolerMaster case has a few unique characteristics to work with: there’s a metal flooring specifically for mounting the motherboard, which makes it handy for installing and mountain components outside the case. Once installed, access to the lower part of the case to the power supply cabling is fairly limited, so it helps to plan out your cabling needs before screwing anything in. This includes any wiring to the power supply, hard disk drives, and card reader. Side view of the install in progress: front is on the left, back on the right. The black snake cable goes from the power supply to the motherboard on level 2. Installation of the CPU cooler fan required an extra to YouTube for a walkthrough. While it’s not technically hard to do, the fitting of the cooler support required fine fitting of screws and angles while not damaging the CPU. The Silverstone USB 3.0 card reader caused a temporary kerfuffle and a trip to Fry’s: during spec planning, I missed that I would be putting the 3.5″ size unit into a 5.25″ bay, so I needed to pick up a bay adapter. And then once I had the card reader installed, I couldn’t get a CF card fitted into the slot. After a moment of ‘did-I-order-the-wrong-part’ panic, I realized that CF cards go in upside down into the unit. Hm. The two hard drive slots are hot swap, which made cabling super easy. I connected the Intel SSD first to ease installation of Windows 8. I later connected the WD 2TB drive once Win8 was up and running. Front view of the full install, everything up and running. DVD and card reader on the left, the two hot swap drives on the right. You can also see how I masked off the On/Off buttons to prevent paint clogging. The single hardest part of the install? Moving my data from one big HD to another. Transferring over our home network was easy but slow. I had an Easy Transfer cable left over from the XP-to-Vista migration, the Windows transfer software limits transfer from just one primary hard to another, so I couldn’t just move from my media to the new secondary 2TB drive. I ended up using a portable Seagate 500GB drive as the go-between, and simply copied it from one machine to another using TeraCopy, which is faster than the standard Windows File-Copy process. 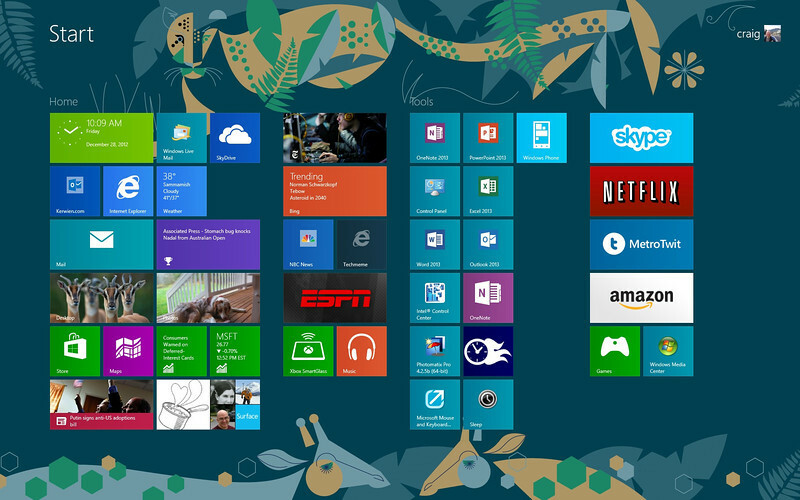 Additionally, Windows 8 is humming along nicely, and seems to have settled in well with the new hardware. The latest version of Office runs smoothly, as does Lightroom and Photomatix. I haven’t yet installed the Windows Phone developer tools, that will be a 2013 project. Overall assessment: mission accomplished. Now let’s see if I can break in that copy of Borderlands 2 I picked up over the holidays. In addition to its rugged good looks and charm, the Cooler Master HAF XB case supports a full ATX motherboard, ample room for components and cabling, hot swap drive bays, and easy in/out access. Although the XB was designed as a test bench case for frequent part swapping. I really just liked it’s overall form factor and carrying handles. 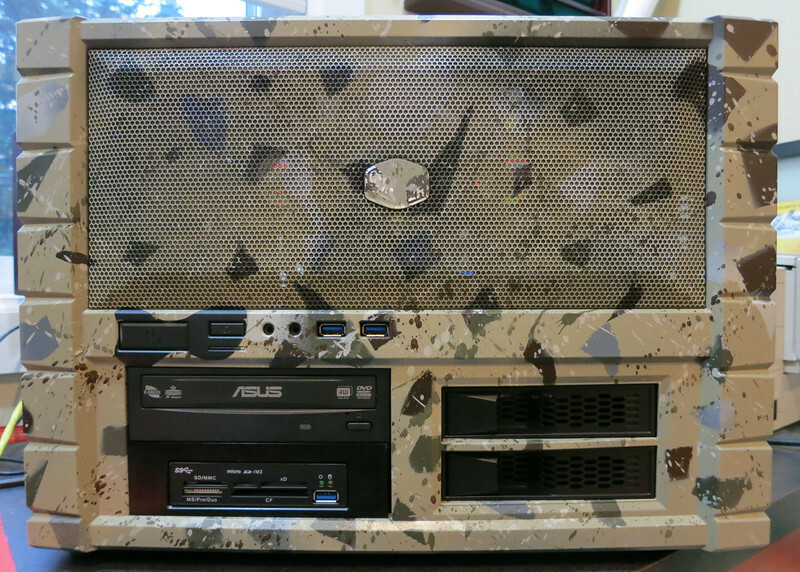 My goal for the paint treatment: create an “offroad” theme punctuated by motorcycle tire tracks across the case. I’ll be using Krylon spray paint with adhesive promoter on the base, and use blue painters tape for masking off patterns and holes. 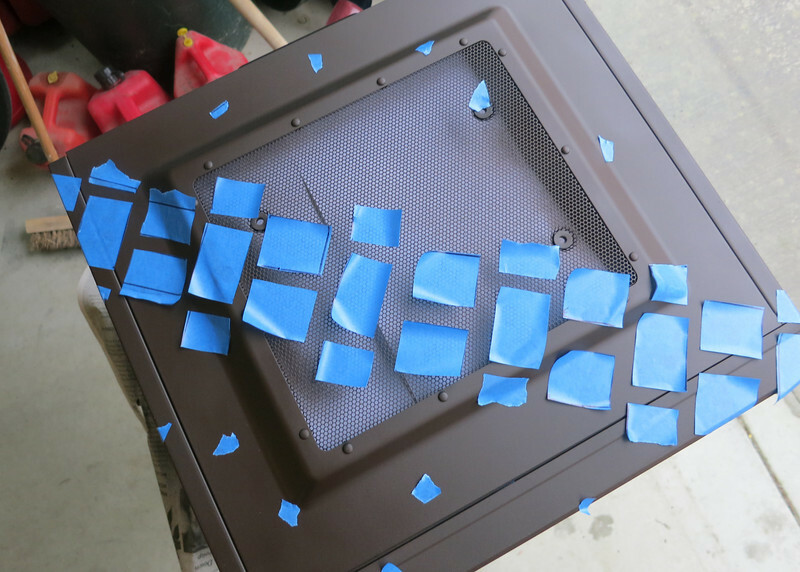 First: Remove and seal off any air gaps so that the paint would not get into the case and inhibit the future build process. 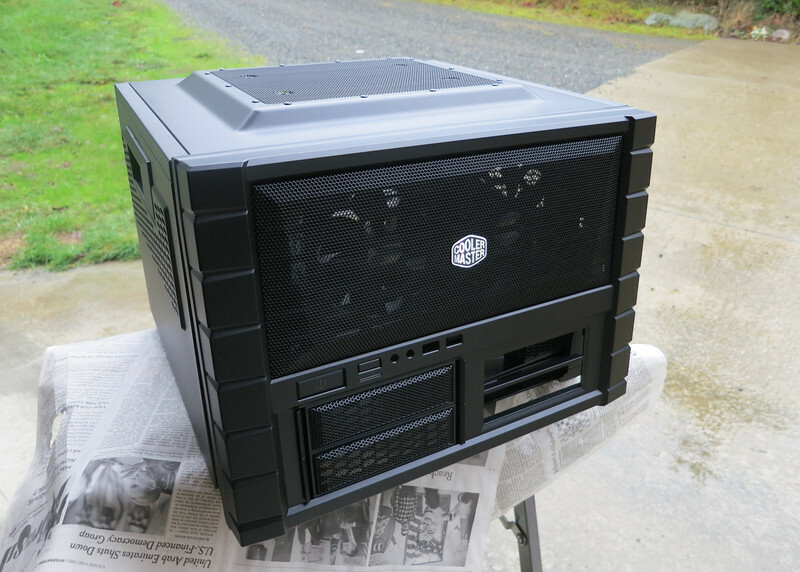 The “HAF” part of the case name stands for “high air flow”, which means a lot of holes to seal. 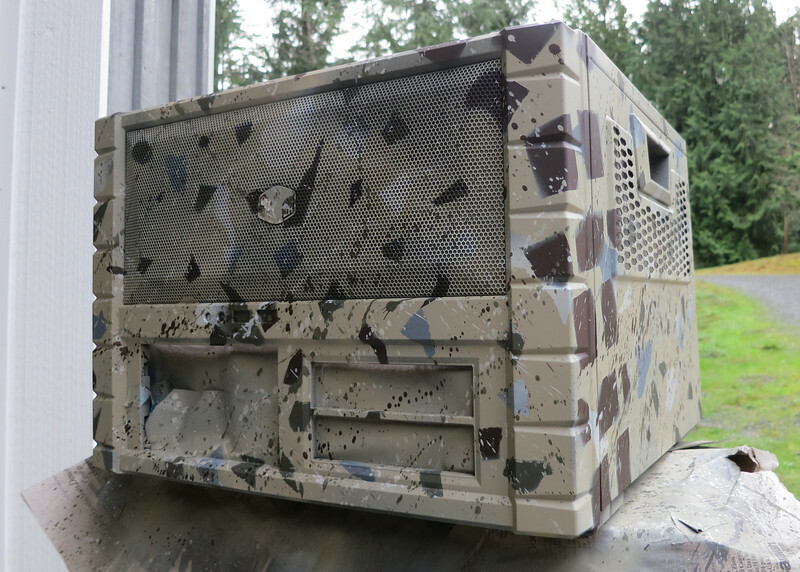 Remove the top, front, and two side panels. Blocked off all the vents from the inside, as well as the entire back panel from the outside. 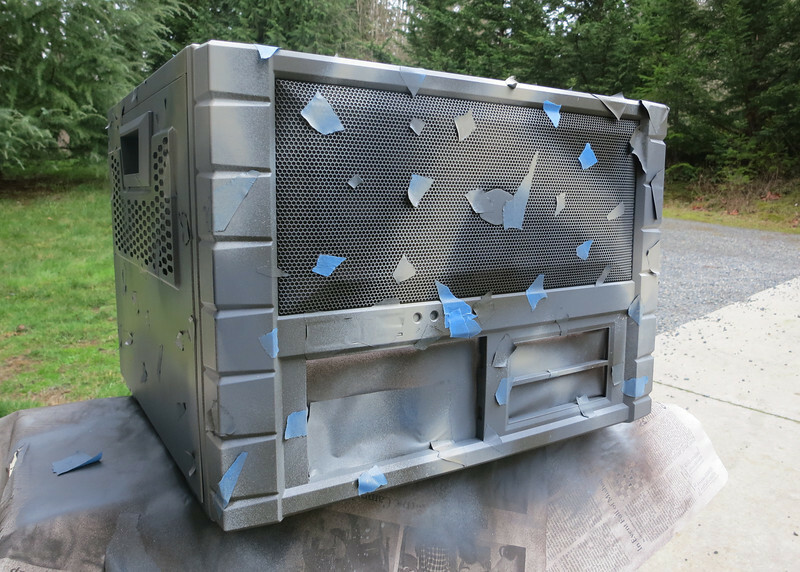 Then I put all the panels back on the case, as I would be spraying the entire unit together. I also masked off the On/Off and Reset buttons, so that paint wouldn’t get into the ignition switches. In my favorite clean and well lit place (AKA the garage bay opening), I sprayed the case with adhesive promoter, and then a base layer of brown, which would be the layer for the tread marks. 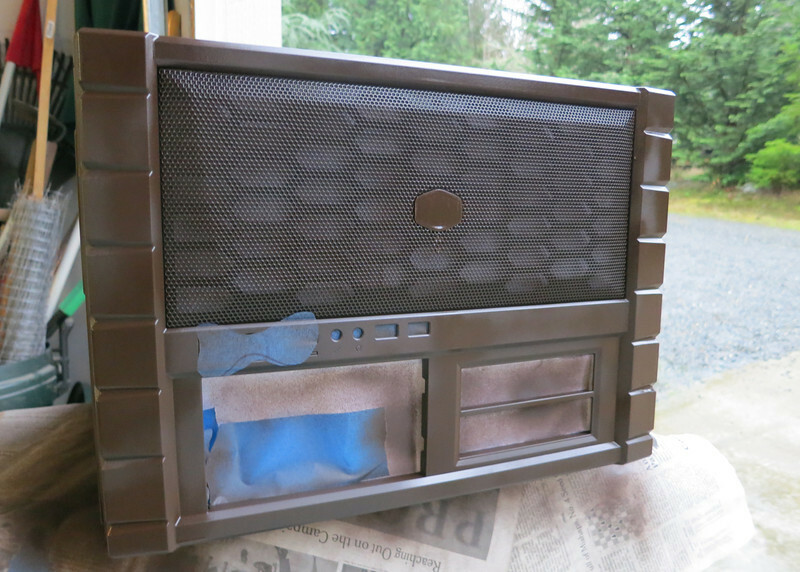 Brown base layer applied to the case. This view also shows the masking of the ignition switches on the front panel. Apply painters tape as the tire tracks. The tread pattern comes from a TKC80 tire, which I carved out with a xacto blade and placed on the case with the right sizing. I specifically kept some edges of the tape off the case to create an organic pattern so that the paint would not create a crisp edge, just as a real tire would do in mud. View of top panel with tire tracks masked off – notice some edges are deliberately not flat. After the tire tracks were done, I incrementally applied different mask layers for rocks and color to build up the all terrain feel. For the finishing touches, I sprayed different colors onto a paint brush, and use the ‘splatter’ technique to give the case organic texture and depth. The technique is to simply snap a brush at the base while the brushes are full of paint, creating splash effect on the case. 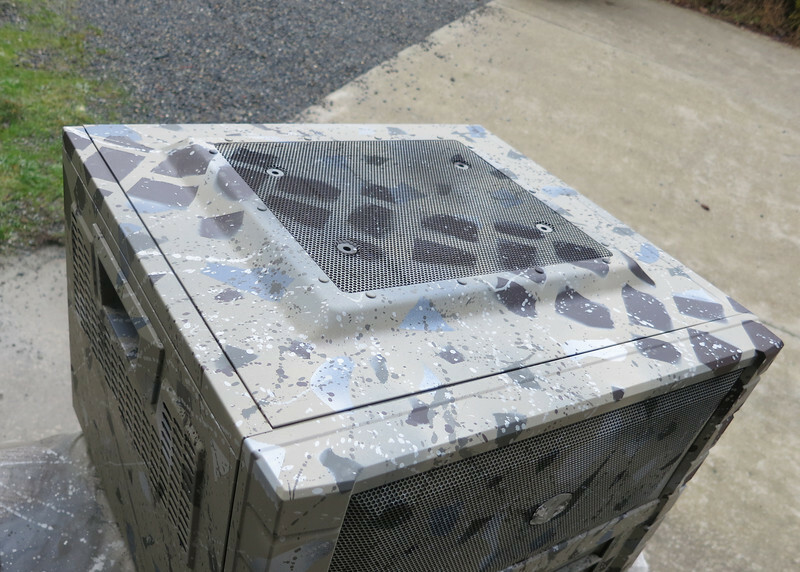 When everything dried, I sprayed clear coat around the base to protect the exterior from the sun and random scratches. I let everything dry for 24 hours before starting the build process. Typically, it takes 2-3 hours for paint to dry before you can touch it, but it really takes 4-5 days for the paint to fully cure. It was time to build my own PC: tap into performance boosts with USB 3, 16GB RAM, solid state drive, bigger/faster media storage, and Windows 8. Keep everything affordable. 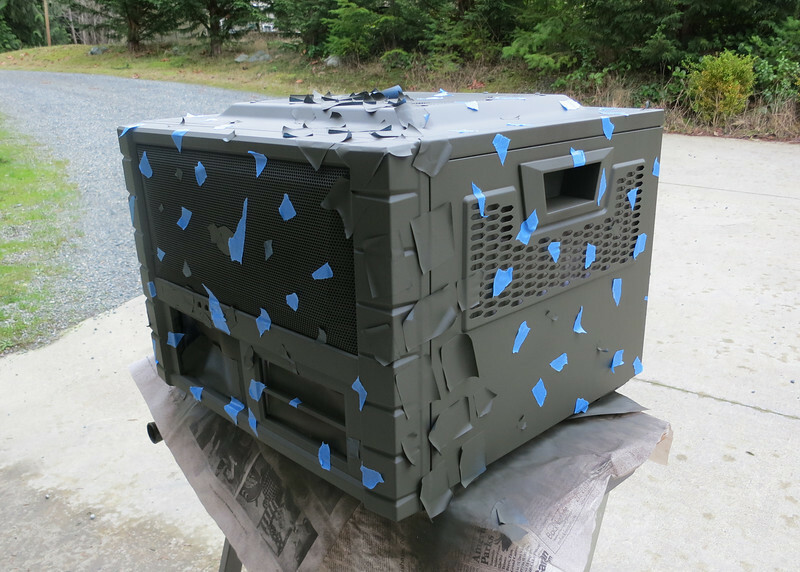 And add a fun custom paint treatment on the case. Here’s the spec sheet on parts – overall a good solid mid-range machine to be used for photo and video production, app development projects, as well as general productivity with Office, news, and email. â€¦at the time of ordering, my final cost was just under $1500. 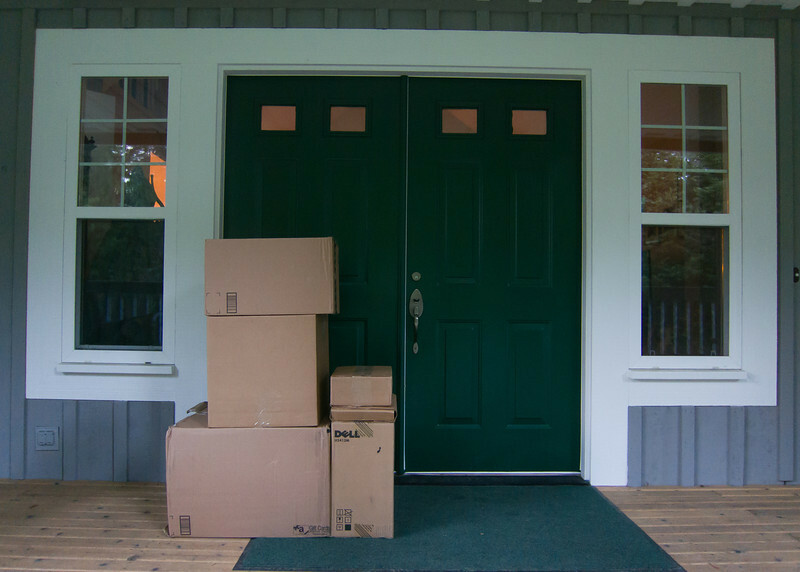 I used a combination of Amazon and NewEgg for final sourcing. Prices change all the time in the hardware industry, and PC Part Picker is a good resource for staying on top of the ebb and flow of prices. 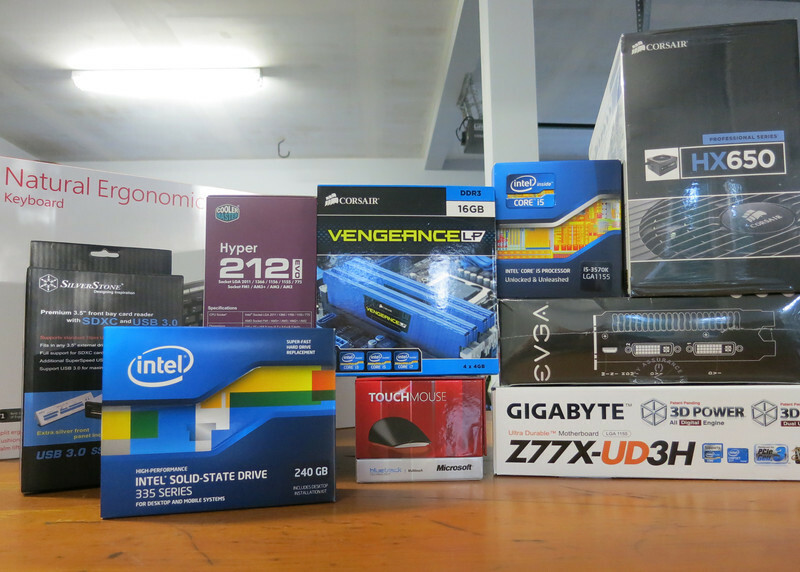 Building a PC is easier than most realize. Most of the time is spent reviewing specs to make sure everything fits together. Should be a de rigueur skill for any self-respecting IT Pro. The hardware industry hasn’t quite caught up to USB 3.0 yet. It’s getting there, sourcing the right card reader with case adapter with motherboard with case turned out to be more time consuming than I expected. The industry also isn’t there yet on touch screens for desktops. They’ve invested first in All-In-Ones SKUs. I found a few standalone touch screens in the $600 range, which was too pricey for me. I expect this will go down over the next 12-18 months. 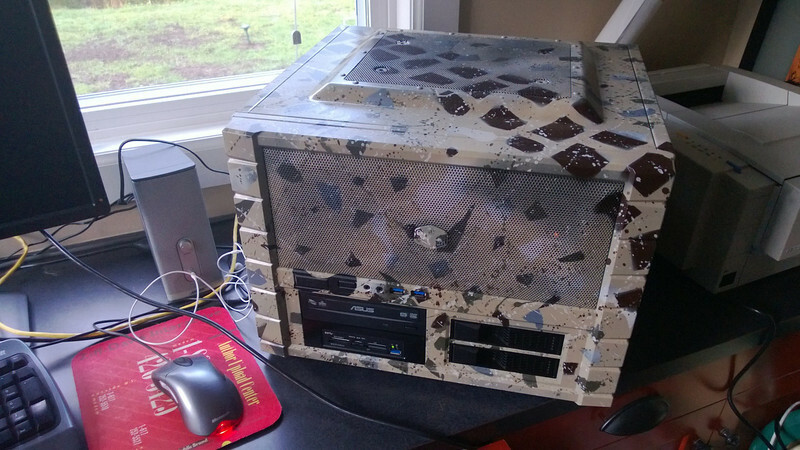 Meanwhile, I picked up the well rated 24″ Dell. I went mid-range with the I5 chip and GeForce 560 graphics card, thinking I’m at the right price/performance value spot. The Intel 256GB SSD is for the OS and various apps downloaded from Win8, including the latest version of Office. I’ll use the WD 2TB hard disk for everything else. Time to find the box cutter! 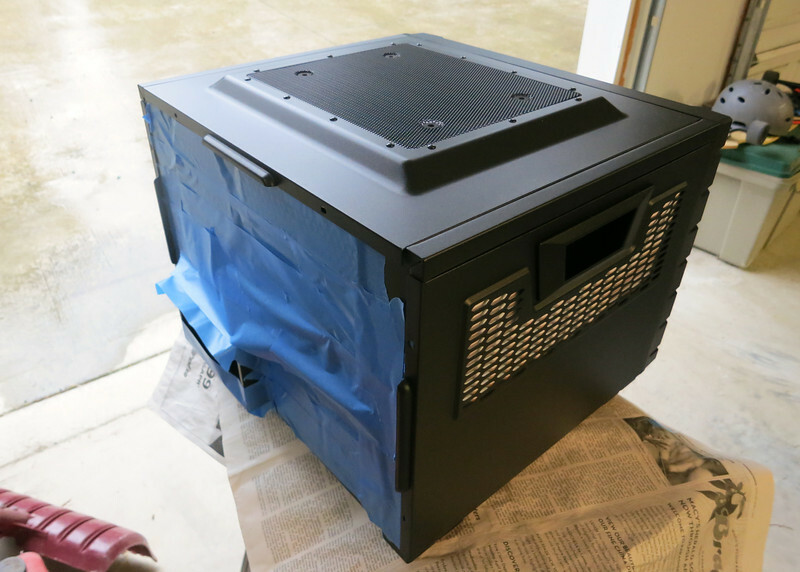 Before I get started with the build, I have to paint the case.